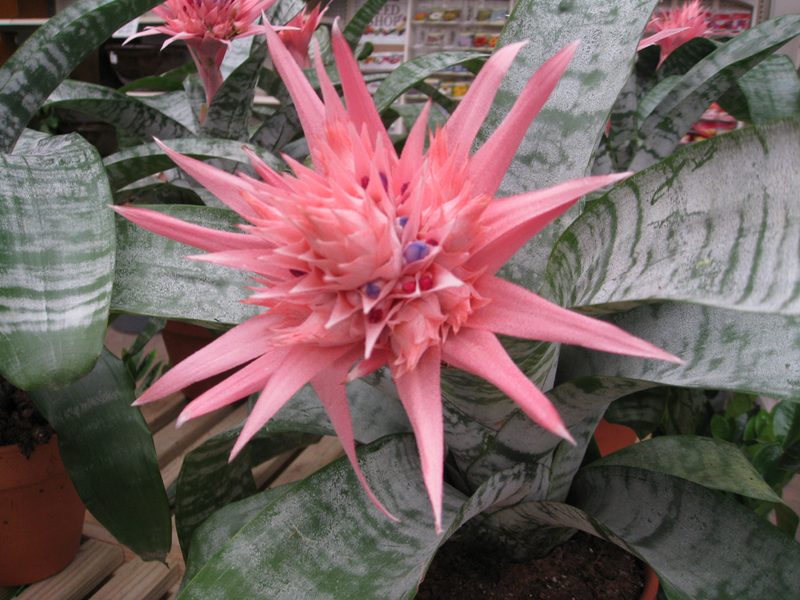 Comments: A rosette of striking, coarse textured silver colored foliage from which an exotic flower arises on a stalk. Very popular container plant for indoor decorations because the flowers remain for a long period. Keep water in the cup formed by the rosette of foliage. The soil should contain a generous amount of peat moss. Fertilize every two month during the warm months of the year. Protect from freezing temperatures. Bromelaids can be encouraged to bloom by placing the plant in a plastic bag and putting a ripened apple in the bag for about seven days. Place in a position that receives morning sunlight. Remove side shoots from mature mother plants when they are half the size of the mother plant and place in a potting soil for rooting. The mother plant dies after flowering.